The healthcare industry continues to be in a state of flux, as more and more hospitals, doctors and insurance providers try to find new and efficient ways to provide the best level of care at the lowest cost. One of the ways the medical industry is doing this is by moving away from the well-worn "volume-based" model of treatment to the newly popular "value-based" model. The difference between these models basically comes down to how doctors and hospitals are paid for their services. Volume-based treatments focus on the number of services these institutions provide (i.e., how many tests are ordered for a single patient), while value-based treatments focus on patient outcomes. "Put simply, [in a value-based model], payments change hands depending on how healthy patients are ... In the volume-based model, many healthcare providers were incentivized to order test after test in order to receive greater reimbursement ... In the value-based model, the cost-effectiveness of all those tests better be provable, as the strategy holds organizations responsible for value at the point of care." -- The Medical Scribe Journal. Advocates for the "value-based" model argue that moving the payment system to focus on cost-effectiveness will not only save money but also allow providers part of a patient's healthcare continuum have a clearer understanding of patient outcomes versus the overall cost of treatment. For many doctors and insurance companies, the best way to determine the cost-effectiveness of the treatment they provide is through the use of new patient engagement technologies. These technologies pull down the doctor-patient silos and allow the two parties to essentially work together on providing the best level of care in order to ensure the best possible outcomes. One of the areas that matter most in a value-based system is patient outreach, which directly involves the patient in the decisions made for their care. This means moving outside of the standard online patient portal that many hospitals and doctors use to more advanced systems that track not only how a patient responds during treatment, but also in between visits. This means staying in constant contact with patients, a task that can prove daunting when you consider the sheer volume of patients that need to be tracked. A solution for many institutions can be a cloud call center that utilizes the most recent call center technology to help with maintaining patient contact. These cloud-based contact centers enable hospitals to work directly with patients, while also tracking patient calls, sending automated appointment reminders and helping with any billing questions, all in one platform. Another way to assess overall patient outcomes is to utilize the abundance of health-tracking apps in today's marketplace. These apps allow doctors to see a patient's progress by tracking their health data before and after an office visit. 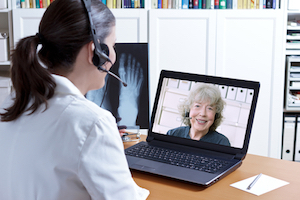 Additionally, these apps can also let a patient be treated via telehealth or virtual treatment that takes place over a video chat system like Skype or GoToMeeting. Telehealth companies like Teladoc are showcasing exactly how this technology can be utilized in a value-based system that helps the patient and avoids time-consuming and expensive office visits. Health monitors like Fitbit have soared in popularity over the past few years, even with people who aren't seeking regular medical care. However, many providers are deciding to adopt this type of technology to help monitor a patient's health, with some experts noting "[this technology] will enable a system to intervene earlier at less cost to the patient and health care system.” This is especially true for patients with chronic health ailments, like congestive heart failure or diabetes. Discovering the best way to treat patients while also keeping costs down will continue to be one of the biggest debates in the medical field. Many within the industry, however, hope that as more providers adopt these technologies and the value-based model altogether, we will one day see a system that is both effective for patients and cost-efficient for providers.